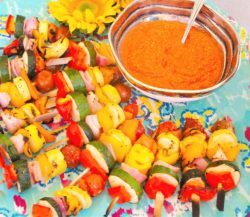 Vegetable Kabobs with Romesco Sauce | Recipe For A Party | Life is a Party, So Celebrate! 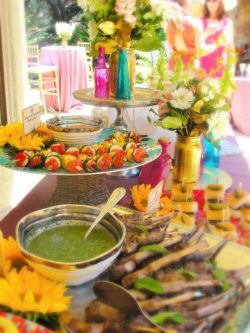 Menu selection at any party can be overwhelming and my clients’ tend to choose a lot of comfort foods and dishes that may be too heavy, it’s understandable since many people don’t entertain that often so they tend to want everything! I help people choose menus and guide them with foods that are lighter than some, different textures and flavors to combine a menu that everyone will enjoy, especially “small bites” menus where there are numerous selections to choose. 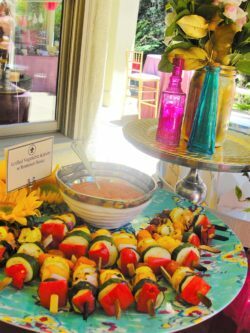 Healthy menu items do not have to be boring, these vegetable kabobs are colorful, flavorful and refreshing…remember your mom telling you that you can’t have dessert unless you eat all your vegetables? Grilling the skewers bring out the sweetness in these vegetables and when paired with my beautiful Romesco sauce, it truly is a Recipe for a Party! 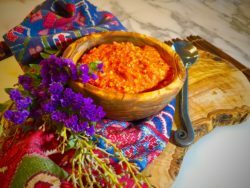 Enjoy these any time of year, but I like to serve these during the warmer months when people like to entertain outdoors and when vegetables are at their peak of freshness. 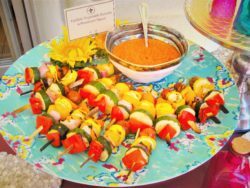 Place them on a platter and serve with the romesco sauce on the side so guests can decide how much sauce they want, please do not skip the romesco sauce, it’s so full of flavor and is wonderful with these skewers.